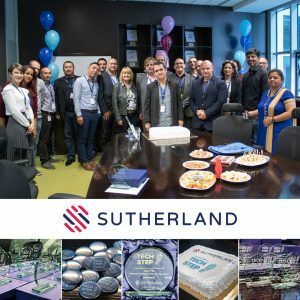 On October 12 at an official ceremony at Sutherland’s Serdika office in Sofia the first group of 10 trainees at Sutherland’s Enterprise Technical Academy were welcomed to the Sutherland family. The graduates are joining the prestigious enterprise technical support teams at the company and were warmly welcomed by senior leaders including Harita Gupta, VP and Global Head Enterprise Business. What is Enterprise Technical Academy? Sutherland Enterprise Technical Academy is a premium training program provided by Sutherland for free to people who aspire to have a career as Technical Engineers in the world of IT and Technical Engineering and speak foreign languages. It is not a software development academy, but a program that trains participants on technology foundations on Windows, Server, Linux, Networking and Switches, Security, Storage, Cloud and Virtualization for 4 weeks period. The Enterprise Technical Academy is a program conceptualized, designed and implemented by Sutherland’s experienced enterprise certified team. What some of the graduates shared? Good luck to all graduates and welcome to Sutherland! The second edition of Sutherland Enterprise Technical Academy starts on October 29th. Learn more and apply here.